Poland lies in the central part of the European continent, the geometrical centre of which is near Warsaw. This is where the lines from Nordkyn in Norway to Matapan in Greece, and from Cabo da Roca in Portugal to the central Urals intersect. The boundary between the East and West European continental masses also runs through Poland. Poland's total surface area is 322,500 sq km (312,600 sq km of land, 1,200 sq km of inland waters, and 8,700 sq km of territorial waters). This makes it the ninth largest country in Europe, after Russia, Ukraine, France, Spain, Sweden, Germany, Finland and Norway, and the 63rd largest in the world. In 2003 Poland's population stood at 38,111,000. At the end of 2010 – about 38,464,000. This figure makes it the 29th most populated country in the world and the 8th in Europe. Before, it ranked seventh, but was surpassed by the independent Ukraine. It is forecast to regain the seventh place position roughly by 2030, surpassing Spain. The first post-war census, held in February 1946, showed that 23.9 million people lived within the new Polish borders; in 1939, just before the war broke out, Poland's population was estimated at about 35 million. The country's losses due to military operations, fighting, extermination in death camps and forced deportations were among the highest in the world. An important factor was the dramatic shift of Poland's borders in 1945, as a result of which some one-fourth of the pre-war territory was lost to the Soviet Union. Population density rose from nearly 80 people per sq km in 1946 to almost 124 in 2001. In Europe, this is the same density as Denmark's. The first post-war years (1945-1950) saw intensive migrations. The new authorities pursued a program of populating the west and north territories. Most of the resettled people came from central and south-east Poland; others were repatriates from the terrains annexed by the Soviet Union or war emigrants returning from all over the world. It was a virtual exodus – between 1945 and 1947 about 5 million people settled in west and north Poland. While Poles returned to their country, Germans, Ukrainians and Belorussians emigrated or were deported – of the 23.9 million people who lived in Poland in 1946, non-Polish nationality was declared by 3.4 million. In later decades (1950-1980) migrations were of an entirely different character. Following large-scale industrial investments undertaken by successive communist governments, people from industrially undeveloped regions moved to areas where extensive construction works were carried out (mainly the cities of Warsaw, Cracow, Katowice, Lodz and Poznan). This was accompanied by the migration of the rural population to urban centres (in the 1950s, 700,000 people moved to towns every year), which led to a dramatic change of the ratio of urban to rural population. While in 1946 about 68 percent of residents lived in rural areas and about 32 percent in towns, today the figures are respectively 38 and 62 percent. The main population concentrations are the industrial agglomerations of Katowice (about 4 million people), Warsaw (about 2.5 million), Gdansk and Poznan (about 1.5 million each). The least populated areas are the north-east and north-west farmlands. Ethnically, modern Poland is almost homogenous. According to the 2002 Census, the minorities account for about 3-4 percent of the population, which is equivalent to some 1.5 million people. In the inter-war period (1918-1939) the Second Republic of Poland had 11.3 million citizens of non-Polish nationality, who constituted 35 percent of the entire population (as surveyed in 1931). This dramatic change in ethnic structure was due to the atrocities of the Second World War and the post-war policy of Poland's communist authorities. About 6 million lives were lost as a result of military operations and mass extermination; another 6.5 million found themselves outside the changed Poland's borders, and 1.7 million people were deported or forced to emigrate. The biggest minority in today's Poland is the Germans. Their number is estimated as about 150,000 (800,000 in 1931) and they live mainly in Silesia. The second biggest group is the Belorussians, who number about 49,000 (1.9 million in 1931) and live mainly in the east. The third largest minority is the Ukrainians, who after the war were forced to resettle in the new territories in the west and north part of the country. Their number is about 31,000 (5 million in 1931). According to the 2002 census, 36,983,700 people, or 96.74% of the population, consider themselves Polish, while 471,500 (1.23%) declared another nationality, and 774,900 (2.03%) did not declare any nationality. The largest minority nationalities and ethnic groups in Poland are Silesians (173,153 according to the census), Germans (152,897 according to the census, 92% in Opole Voivodeship and Silesian Voivodeship), Belarusians (c.49,000), Ukrainians (c.30,000), Lithuanians, Russians, Roma, Jews, Lemkos, Slovaks, Czechs, and Lipka Tatars. Among foreign citizens, the Vietnamese are the largest ethnic group, followed by Greeks and Armenians. The Polish real estate cadastre was formed under influence of cadastral systems applied in neighboring countries: the Prussian and the Austrian Empires in the middle of the 19th century. In post partition period, i.e. after 1795 a part of the Polish state, which was included to Austria, was embraced by Austrian cadastre, while land of the Prussian partition - by Prussian cadastre. Real estates placed in the Russian partition were not embraced by a unified land cadastre. A family Estate of Zamoyski family (Ordynacja Zamojska) was an exception where there was established a detailed register modelled on Austrian cadastre. The range of Prussian cadastre and Austria cadastre is shown on the map below. The coverage of Prussian cadastre (in blue) amounts 40% and the coverage of the Austrian cadastre (in green) - 14%. For the remaining part of the country, depicted in white color i.e. 46 % of the country's area (the Russian partition), no cadastral documentation was prepared. These first origin cadastres in Polish territories significantly influenced the development of the Polish cadastre, its progress direction, dynamics and regional dissimilarity. Preserved cadastral documents coming from that time are still in evidence force as regards proving the right of ownership. Moreover there are regions (Śląsk, Wielkopolska and Pomorze) where the land and building register (real estate cadastre) is still kept according to their patterns. Cadastral maps were prepared in a number of local coordinate systems (e.g. Gniezno System, Toruń System). Cartographic content of maps was supplemented with letter descriptions of land uses and soil classes, parcels numbers, explanatory comments (names of adjacent cadastral units, descriptions of roads and so forth). In the first period cadastral maps were prepared for area section (cadastral sections) with division for sheets in scales 1:5,000 or 1:2,500. The 1:4,000 and 1:3,000 scales were also used, due to scales of the original maps coming from the period of cadastre establishing. In the period after 1877 new cadastral maps were implemented in the area unit division in the scale 1:2,000 (for rural areas) and in the scale 1:1,000 (for territories with high density of parcels). The process of real estate cadastre establishing was completed in 1877. From that time the eleven Cadastral Instructions started to function enabling gradual improvement of cadastral surveys and calculations together with successive replacement of cadastral maps. The Second Instruction for updating cadastral documentation was of special importance for continuity of cadastre maintenance. In the between-war period in the territory of the Pomorskie, Poznańskie Regions and partly Śląskie Region the cadastral documentation was kept (continuation of the Prussian Cadastre) on the basis of the Act of 1919 on Organisation and Scope of Activities for the Ministry of Public Works. The documentation of Austrian Cadastre comes from the 19th century beginning with the issuing of the Patent by the Emperor Francis I dated 1817 concerning Land Tax. However the materials with appropriate quality come from the period after 1883, because they were produced on the basis of the rules for running and maintaining of cadastral documentation for land tax in the up to date state. The documentation of Austrian Cadastre covers the following regions in Poland: Rzeszowskie, Krakowskie (except county of Olkusz and Miechów) and a part of Katowickie (counties of Cieszyn and Bielsko-Biała). Until now circa 30% of present documentation of land register from the above mentioned territories was created on the basis of materials from the previous Austrian Cadastre. Austrian Cadastre documentation was prepared in the form of maps and cadastral books for each cadastral municipality. descriptive part i.e. books: parcel report, sheets of land possessions, list of sheets, alphabetical list of possessors, mortgage registers. The enfranchisement documentation was prepared by virtue of the Ukase of Car dated 1864 on affranchising of peasants on areas incorporated into Russia. bestowing tables - concerning state governmental properties. The process of affranchising in the Russian partition was not accompanied with land surveys, as it was the case in the former Prussian partition. Due to this reason inscriptions concerning the affranchised settlements were of tentative character. The land surveys were conducted at a later period and they resulted with maps of affranchised land (usually for a group of villages) and new calculations of areas of settlements and land uses for liquidation tables. Documents, which confirm the right of ownership in the form of extracts from the liquidation tables, come from the times of enfranchisement of peasants. These documents were produced on the basis of parcels maps of relatively good quality, which were prepared in local coordinate systems in new Polish measures initially and in the Russian system of measures after 1891. The new surveys conducted after 1891 in the Russian system of measures constituted a basis for production of maps in the scales 1:4,200 or 1:8,400. The lack of complete coverage with maps for this area was a major reason that hindered establishing of land cadastre. In 1859 the Surveying Office was established under the Central Chancery of Zamoyski Estate in Zwierzyniec near Zamość. This Office established the land cadastre between 1865 and 1900 known as "Zamoyski Cadastre". The basis for this register was a map of scale 1:5,000 and the surveying and classification register patterned after the surveying rules of the Austrian Cadastre. During the interwar period documentation of Zamoyski Cadastre was used for liquidation of real servitudes, and after the Second World War for the purposes of the Agrarian Reform for the area in question. Presently the documentation of Zamoyski Cadastre is of only archival importance. After 1945 the issue of establishing a unified land cadastre in Poland was still a significant and unsolved economic problem of the state. The same referred to soil valuation and formulation of functions for cadastre in view of new political system. The first legal act, which assumed a need for establishing and continuation of real estate cadastre in Poland, was the Decree of 1945 on the State Geodetic and Cartographic Service. By virtue of this Decree this task was entrusted to the Main Office for Country Measurements. The first legal regulation concerning the cadastre issued in Poland after World War II was the decree on land and building cadastre dated 24 September 1947 (Journal of Laws No. 61, pos. 344). Its legacies constituted about establishment of a unified multi-purpose land and building cadastre for the whole area of Poland. source of information and data on land, their owners for different fields of engineering and social and economic life. The Decree envisaged also establishment of building cadastre. The structure of the unified cadastre was based on the patterns of cadastres that already existed. However the political changes that occurred in Poland were unfavourable for this task (liquidation of private ownership, apotheosis of state and public ownership, possession identified with factual status). Data and information supply for different organizations and branches. The rules of the Decree of 1955 in comparison to the Decree of 1947 do not indicate significant differences. In principle the executive acts to the Decree, i.e. The Instruction of the Minister of Agriculture dated 1955 and the Instruction of Ministry of Communal and Housing Management dated 1956 and subsequently the Order of Minister of Agriculture and Communal Management, dated 20 February 1969, had the fundamental influence on the shape and content of the established register. Their content was determined by the fiscal purposes. The ownership of real estate was treated marginally and they focused on possession mainly. The land parcel as the basic object of area division, was defined as "track of land which an object of separate possession", and the possession was understood mainly as spontaneous possession. The priority for establishing the cadastre of lands and buildings was gaining data for fiscal purposes. By this reason the works on establishing the register of buildings were delayed for future. Consequently the data on buildings, which were plotted on some cadastral maps on the basis of direct measurements or photogrammetric measurements, were not updated and gradually lost their reliability. In many cases they limited only to plotting contour line of the built-up land use. exclusiveness as source of data of actual state of land use. Register of land and buildings was named real estate cadastre in act dated 17 May 1989 - Geodetic and Cartographic Law (Journal of Laws of 2005 No. 240, pos. 2027 with further amendments): 'until transfor­mation of land and building register into real estate cadastre, the cadastre is understood as this register' (article 5a of the Act). According to the art. 2, point 8 of the Act register of land and buildings (real estate cadastre is understood as 'is a uniform collection for the whole country of systematised, updated data on land, buildings and premises, their owners and other natural persons and corporate bodies holding these lands, buildings and premises'. Running the real estate register as a task of the government administration is assigned to chiefs district official (starosta) and Presidents of the cities governed on district laws performing his tasks with the assistance of the district surveyors. Control on starosta's (district chief official) actions w within the scope of these tasks is performed by province heads (voivodes) with the assistance of Regional Inspector for Geodetic and Cartographic Supervision. Central governmental administration unit supervised the State policy within the scope of these tasks is Surveyor General of Poland. Land and building register embraces the whole land territory of Republic of Poland together with inland surface waters and part of land under internal sea waters. constitute the basis on which a national land information system will be established (according to art. 5 of the Geodetic and cartographic law). Figure 1:	Coverage of Poland with cadastral documentation of former Prussian and Austrian cadastres. By virtue of the Decree on State Geodetic and Cartographic Service dated 13 June 1956 (Journal of Laws No. 25 position 115) the Central Office of Geodesy and Cartography (CUGiK), which had been subjected to the Prime Minister, was subordinated to the Ministry of Internal Affairs – since 2011 - Ministry of Administration and Digitization. According to the Article 2 the bodies of the state geodetic and cartographic service were: the Central Office of Geodesy and Cartography (further Head Office of Geodesy and Cartography - GUGiK) and the ministerial geodetic services that could execute definite geodetic tasks after order of the Council of Ministers. The Regulation on Scope of Activities for Organs of State Geodetic and Cartographic Service dated 13 June 1956, which was issued on the basis of the Decree, defined the detailed scope of activities for GUGiK and Ministerial Services. Minister of Communal Management - for towns, which were excluded from regions and counties. In January 1957 in the Ministry of Agriculture there was established the Department for Rural Land Development in which the Division for Geodesy and Cadastre was responsible for establishing the Land Cadastre. In Regions the Regional Offices for Geodesy and Rural Land Development were appointed. They included the Section for Map and Land Cadastre Updating and the Section for Soil Mapping and Rural Land Development, which were responsible for establishing the documentation of Land Register (Cadastre). The Land Cadastre (without Buildings) was established by the executive ministerial units with the assistance of surveying companies which belonged to the Head Office of Geodesy and Cartography and the intervention teams of the Ministry of Agriculture. Currently the central body of government administration responsible for issues of geodesy and cartography is the Surveyor General of Poland, who performs his tasks with the assistance of the Head Office of Geodesy and Cartography. Supervision of the Surveyor General of Poland is administered by the minister appropriate for public administration. chief district official (starosta) performing his tasks with the assistance of the district surveyor, being a member of the district chief official's office. The district chief official, on a motion by the municipality entrusts the head of the municipality (wójt) or mayor or town president, by way of agreement, with matters being within the scope of his tasks and competence, including the issuing of administrative decisions after satisfying the appropriate conditions. The head of a municipality (mayor, Presidents of the city) manages the entrusted issues with the assistance of the c municipality surveyor who is a member of the municipality office. The regional inspector of geodetic and cartographic supervision who, according to the administrative proceeding code, is higher in the hierarchy that units of geodetic and cartographic administration, performs tasks and competence of the Geodetic and Cartographic Service in the name of the region head. Tasks from the scope of land and building register (real estate cadastre) are financed from the budget of the State and from resources of purpose fund (Management Fund for Geodetic and Cartographic Resources), which is generated from charges collected from executors of geodetic and cartographic works and from recipients of information and materials collected in State Geodetic and Cartographic Resources. The Head Office of Geodesy and Cartography is central body of government administration, acts on a basis of the statute conferred by ordinance, by the Chairman of the Council of Ministers. The Surveyor General of Poland is president of the Head Office of Geodesy and Cartography and manages the Office with the assistance of the deputy chairman, director general and directors and managers of organizational units. Head Office of Geodesy and Cartography does not have branch offices or local branches but it acts for the whole area of the country. Main Geodetic and Cartographic Documentation Centre In Warsaw established as a subordinated organisation assists in activity of Head Office of Geodesy and Cartography. Geodetic and cartographic works are performed by bodies pursuing economic activities and also other organizational units established in accordance with legal provisions, should the subject of their activity comprise performance of such work (art. 11 of Geodetic and Cartographic Law). drafting and processing geodetic documentation, establishing and up-dating data bases, as well as photogrammetric, gravimetric, magnetic and astronomical measurements and elaborations related to the substantiation of tasks in the field of geodesy, cartography and the national land information system. According to the Act dated 2 July 2004 on freedom of business activity, entities running business activity are „businessmen" (Journal of Laws of 2007 No. 155, pos. 1095). According to the article 46 clause 1 and article 75 clause 1 of the Act dated 2 July 2004 on Freedom of Business Activity for running business activity in the field of geodesy and cartography any licence or permission is required. According to the article 14 of the Act businessman can undertake business activity after registration in businessman register in the National Court Register or in the Business Activity Register. Performing of some activities, which in art. 2, point 1 of the Geodetic and Cartographic Law are mentioned as geodetic and cartographic work, comes within duties of Geodetic and Cartographic Services' tasks, e.g. updating cadastral data base and processing geodetic and cartographic documentation in process of this updating as well as making of extracts and copies from cadastral documentation. Regulations of art 11, 12 and 42 of Geodetic and Cartographic Law are not applicable for these activities. According to art. 42-45 of Geodetic and Cartographic Law, independent function in geodesy and cartography, can be performed by natural persons, who acquired adequate professional licenses granted by the Surveyor General of Poland. These professional licenses shall not be granted to legal entities and organizational units. Most of the cadastral surveyors are member in the "Association of Polish Surveyors - SGP), which has about 4000 members. SGP is member in FIG. The private sector cadastral surveyors is mainly associated in organization: SGP (Association of Polish Surveyors), PGK KZPFGK (Polish Commercial Geodesy Employers Association of Geodetic Cartographic Firms), GIG (Chamber of Surveying Enterprises) which is also representing the interests of the private sector. PGK KZPFGK and GIG are the members of CLGE (Council of European Geodetic Survey). performing geodetic and cartographic works as may be imperative to make entries into land and mortgage registers and such works the result of which could lead to danger to life or health. Licenses for performing independent functions in geodesy and cartography, hereinafter referred to as 'professional licenses' are granted by the Surveyor General of Poland on the basis of qualification proceedings performed by a qualifying committee for professional licenses. enjoy an impeccable professional standing. location of triangulation structures on land and building objects. Total surface of land covered with land and building register amounts 312,680 km2, including land within cities' boundaries - 21,563 km2, and rural areas - 291,117 km2. parcels in rural areas – 27,8 M.
84% premises within cities' boundaries and 9% premises in rural areas. The priority for establishing the cadastre of lands and buildings was gaining data for fiscal purposes. By this reason the works on establishing the register of buildings were delayed for future. Consequently the data on buildings, which were plotted on some cadastral maps on the basis of direct measurements or photogrammetric measurements, were not updated and gradually lost their reliability. In many cases they limited only to plotting con tour line of the built-up land use. 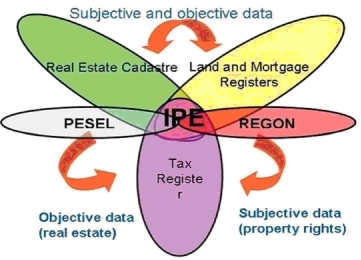 Integrating Electronic Platform (IEP) System allows exchange of data between land and buildings registry, land and mortgage registry and tax register. Also it allows access to data from land and buildings registers for the needs of the Integrated Administration and Control System, as well as other IT systems run by public administration bodies, verification of data in land and buildings registers with data held in PESEL (Universal Population Census Register) and REGON (National Official Register of Economic Subjects). The structure of IEP which is illustrated the following pictures, constitutes the foundation of the Integrated Cadastral System (ICS). The principal modules of the IEP system were constructed between 2001 and 2003 within the construction of the ICS, in conjunction with the Ministry of Justice, Ministry of Finance, Ministry of Internal Affairs and Administration and the Main Office of Statistics. Figure 5:	Data integration within IPE system. Cadastral map is a large-scale map, which contains spatial cadastral data. It can have traditional, analogue form or numerical adapted to information technologies form. reference and cadastral numbers of buildings. The content of the cadastral map can be names of urban complexes, hamlets and tilths. Depending on degree of area urbanization and the structure of land possession, the cadastral map is prepared in scales: 1:500, 1:1,000, 1:2,000 or 1:5,000. Editing the map, particularly in scale 1:2,000 or 1:5,000, its descriptive and informational data on buildings and numbers of boundary points do not have to be shown. For the rest of the country the cadastral map is conducted in traditional (analogue) form or in raster form map completed with vector data, which are result of new surveys. other scales - 7.1% of the country's territory. the rest of the country's territory - on the basis of other elaborations (old cadastral maps, consolidation maps, parcelling maps, management maps of The State Forests National Forest Holding etc.). Modernisation of land and building registers is performed by chief county officials (starosta) and presidents of towns holding county rights. Province inspectors of geodetic and cartographic supervision also participate actively in these tasks, consulting modernisation projects, personnel training and undertaking planned and casual monitoring operations. The modernisation of land and buildings registers also enjoys the support of the Surveyor General of Poland. improving the quality of registration data and giving these data a standard shape. Land and buildings registers contain basic descriptive and spatial information (excluding property values), concerning borders of registration parcels, contours of arable land, classification contours, buildings and also an almost complete collection of information about residence properties. Computer software is also used in these counties to manage a vector registration map for urban areas of complete substance, i.e. holding spatial data concerning the borders of registration parcels, contours of arable land, classification contours and buildings. Implementing an IT system destined for managing the national register of borders and areas of units of the territorial division of the country. Cooperation between the Head Office of Geodesy and Cartography (HOGC) and ARMA is of essential importance in the process of modernising land and buildings registers on rural areas. This cooperation results in the elaboration of a digital orthophotomap for the whole country and its technical parameters being adapted both to the requirements of the LPIS constructed by ARMA and of land and buildings registers. To allow adaptation to the needs of land registers in south-east Poland, the orthophotomap is elaborated in a 1:2000 scale basing on aerial photographs in a scale of 1:13000 and for the remaining area in a 1:5000 scale basing on aerial photographs in a 1:26000 scale, and partly basing on satellite photographs. The map presented below displays the area covered by the orthophotomap in those scales. The results of these projects are standard vector registration map coherent with the descriptive data in this register. Registration data is also be acquired concerning changes of arable land, the border of which will be defined by photo-interpretation, as well as spatial and descriptive data concerning agricultural plots and farm fields. A vector layer of buildings' contours is also created in the projects implemented by the HOGC, the spatial data of which are presently held in the national geodetic and cartographic resources. The results of implementing these projects have a fundamental impact on improving the level of the standardisation of the Polish real estate cadastre and the quality of the data it contains, also allowing this public register to be managed both as regards descriptive data as well as spatial data in computer technology. This project also results in stocktaking of materials collected in the national geodetic and cartographic data resources of significance for the cadastre, and also in assessing the quality of these materials. County surveyors, basing on reports drafted by project contractors, thus possess detailed knowledge of the data collections for which they bear responsibility, and thereby for further operations connected with modernising land and buildings registers, allowing them to spearhead their efforts on eliminating essential errors and irregularities. The scope of this task places basic significance on the organisation and course of quality and quantity control performed in the projects, to ensure that proper results are achieved. Project GEOPORTAL.GOV.PL creates an infrastructure of nodes of National Spatial Data Infrastructure, cooperating together and providing services - from searching, trough giving access, to analysing data. Geoportal is an Internet based portal harmonious with regulations of EC Directive INSPIRE, playing a role of broker, allowing its users to access demanded geospatial information where a key role is assigned to cadastral data. One of the crucial requirements of the developed solution is to ensure interoperability in a meaning of ability for cooperation of nodes regardless to the system, hardware or software platform used, assuming that implementation of the nodes of infrastructure was unanimous with international (ISO, OGC) and national standards (PKN). data of the state register of geographical names. The nodes of National Spatial Data Infrastructure (KIIP) operate on the three levels: central, provincial (voivodeship) and district. The databases of the register of lands and buildings (cadastral data) are placed in the districts, while the warehouses of the topographical data are stored on the provincial level. Physically cadastral data is maintained at the database while applications are supported by application servers. Access procedures to the cadastral data are realized by dedicated applications. Data transmission network is composed of local LAN networks connected to a nationwide WAN network. GEOPORTAL.GOV.PL enables access to geospatial information in the form of redirecting or indication to the outer data (any spatial data services registered in the system) and also be able to act as the data access point that indicates the source of the data (so called "one stop"). Currently completed GEOPORTAL.GOV.PL project will be continued and further developed in following phase called GEOPORTAL 2 focusing on extension of National Spatial Data Infrastructure. This infrastructure will be a part of the wider European Spatial Data Infrastructure by meeting requirements of EC Directive INSPIRE and basing on fully digitalised documents, materials and data contained in the Polish National Geodetic and Cartographic Resource. introducing county units to the Integrating Electronic Platform by the IEP-ZK feed and communication system of the IEP - draw 4.
access to the geodetic network database. County units, which are to introduce the Integrating Electronic Platform system within the "GEOPORTAL.GOV.PL" project GEOPORTAL is becoming a electronic access point to the national geodetic and cartographic resources. 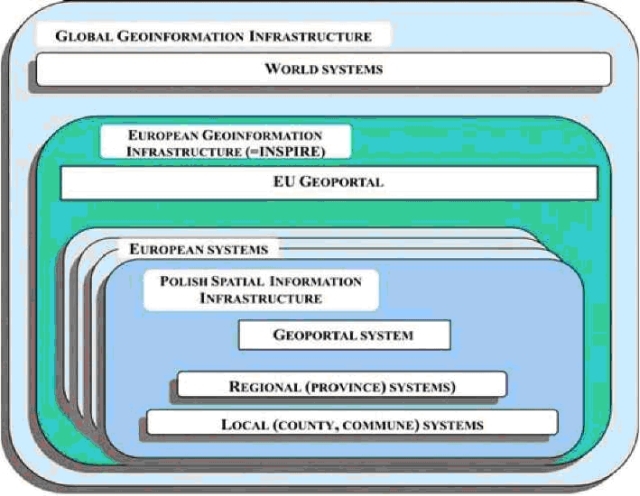 Following schema displays the position of the Geoportal system as a system situated among the "uppermost hierarchy" of the Polish Spatial Information Infrastructure, accessing this infrastructure's services in the European Union's geoportal (EU Geoportal). Figure 6:	Spatial Information Infrastructure. Public register close related to Land and Building Register is Land and Mortgage Register (land books) maintained on the basis of the act dated 6 July 1982 on Land and Mortgage Register (Journal of Laws of 2001 No. 124, pos. 1361 with further amendments). 'The purpose for running the land and mortgage register is to define a legal status of property' (art. 1 clause 1 of the Act). Both registers - land and building register and land and mortgage register, are two independent real estate data sets. Data collected in the registers partly coincide and partly not. Land and building register contains full information of lands, buildings and premises, and limited information of real estate's legal status. On the other hand, land and mortgage register contains real estate's full legal status and limited information of real estate's designation. Land and mortgage register is maintained by local courts of justice (the land book divisions) in accordance with the location of real estate. Currently 350 divisions run the land and mortgage register. It is estimated that about 60% of real estate is registered in land books. Land books are open to public therefore no one can plead ignorance of entries in land book. It is alleged that open right written in a land book is entered in accordance with actual legal status (art. 3, clause 1). Entries in land books on rights for real estate are under public faith warranty of land books - in case of discrepancy between legal status shown in land book and actual legal status, content of a land book decides in favour of person, who purchased through legal activity ownership or other real right from the person entitled according to the land book. According to art 26 clause 1 of above mentioned act the basis of real estate designation in the land book is cadastral data. Since 2003 on the basis of the Act dated 14 February 2003 on Migration of Land Book Contents to the Structure of Land and Mortgage Register kept in IT system (Journal of Laws No. 42, pos. 363 with further amendments) the project of land book computerisation is realized. In most land books courts new land books are established and conducted at once in electronic form. The content of existing land books, conducted previously in written form, is transferred to electronic form (to the NKW system) by way of so called migration, which takes place in special migration centres. The contents of land books included in the NKW system is collected in Land and Mortgage Register Central Database, localized in the Main Centre of Data Processing of Ministry of Justice. Cadastral data have reference character for real estate designations in chapter I of land book, and entries in chapter II of land book related to real estate's owner are binding for authority running real estate cadastre. Guaranteed by legal regulations mutual data exchange between two basic public real estate registers in Poland has been legally initiated since 1983 (entering the act on land book and mortgage into force). Currently the data exchange exists and is realized according to legal regulations. However nearly fifty years of autonomous functioning of these public registers do not allow to talk about the full consistency of common data. 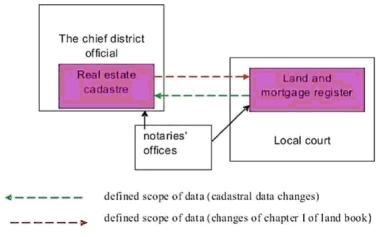 Figure 7:	General scheme of mutual data exchange between real estate cadastre and Land and mortgage register.